Serving Size: 2 Capsules: Vitamin A (as beta-carotene) 750mcg RAE, Vitamin C (as ascorbic acid) 120mg, Vitamin E (as d-alpha tocopheryl) 20mg, Niacin(as niacinamide) 40mg, Resveratrol (polygonum cuspidatum) Extract (root) (50%) 10mg, Alpha Lipoic Acid 300mg, Aloe Vera PE (leaf) (200:1) 200mg, Hydrolyzed Collagen I,III 150mg, Green Tea Extract (leaf) (std. 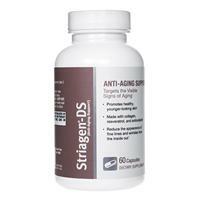 to 50% Polyphenols, 30% Catechins & 5% Caffeine) 100mg, Grape Seed (Vitis vinifera) Extract (seed) (std. to 50% Polyphenols) 100mg, DMAE 100mg, Hyaluronic Acid 5mg, L-Glycine 100mg, L-Proline 100mg, L-Glutathione Reduced 20mg, Turmeric Extract (root) (std. to 95% curcuminoids) 50mg. Ohter Ingredients: HYDROXYPROPYL METHYLCELLULOSE, VEGETABLE MAGNESIUM STEARATE, SILICON DIOXIDE.